Staying relevant – both to employees and to customers – in the modern business world is a strategic challenge with new aspects to it. Driven by development in technology (e.g. digitization) and society (e.g. the growth in gig workers), this is both an impediment and an opportunity to re-frame your understanding of how to stay in so-called Blue Ocean. This blog posts puts light on how to do this. The term Blue Ocean Strategy was coined by W. Chan Kim and Renée Mauborgne, professors at INSEAD and co-directors of the INSEAD Blue Ocean Strategy Institute, in their book by the same name. Over time, new products become existing products. Over time, new problems become known problems. This mean, that you have two ways of surviving: Either by competing in Red Ocean on the same terms as your competitors; or by constantly finding and creating Blue Ocean. Nothing is new so far. This is basic market space understanding. As described above, the unprecedented development in technology and society characterizes the Future of Work, and is called The Fourth Industrial Revolution (Industry 4.0) or The First Digital Revolution. This paradigm shift calls for a new approach to leadership, organizational development, and business models. Take a look at my book, The Responsive Leader, to get an overview of the changes and the mindset that is required. The paradigm shift in leadership and business means, that “staying relevant to employees and to customers” is re-framed, and is not only about the product/problem frame but also about your approach to people, HR, culture, innovation, delegation, teaming/organizing, social capital, engagement models, motivation, and generally an whole new frame of thinking and executing the modern organization. In the illustration above we collapse the problem/product 2D frame of reference in to one dimension, and add a new dimension, namely the approach to modern leadership, OD, and business models. By doing this we get a new model for mapping and discussion market space development, which is not limited to competing on price and effort, but also describes a lot of interpersonal aspects. You can stay relevant via your approach to purpose, meaning, and value creation. You can stay relevant via the way your business model is, and the way you hire and pay employees and gig workers. 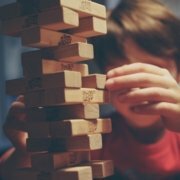 You can stay relevant via your ability to adapt and execute your tactical activities in an agile way. Competition and competitiveness is not only about price-and-product fit, but also about value creation, social capital, and relationships. In Blue Ocean, you should see your culture as a USP (Unique Selling Point), both to employees and to customers. As an example of an organization, that does this deliberately, take a look at Pingala: They constantly look for Blue Ocean regarding culture, mechanisms for organizing, and engagement models. “Our culture is or product” is a mindset and competitive edge for them. Inspired? New book coming up! In the classical sense, where are you in Red/Blue Ocean? 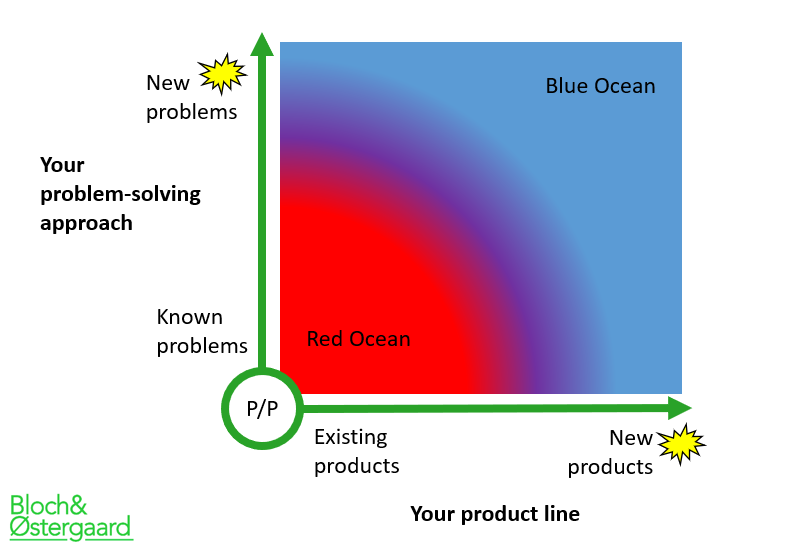 Are you solving known problems with existing products? Look at your Future of Work-characteristics (see for example the description in these slides from a key note). Where are you different from your competition? On your approach to purpose? 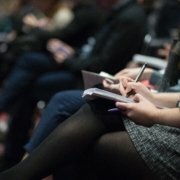 Regarding your agile tactical execution? Your way of being innovative? Your culture and ability to create a place where people belong? Your ability to use your network and organize in teams? Where do you want to be? And why? What do you want to gain? Happiness? Attract and retain employees? And customers? Make a plan for your intentions, and start experimenting with your actions to develop yourself. 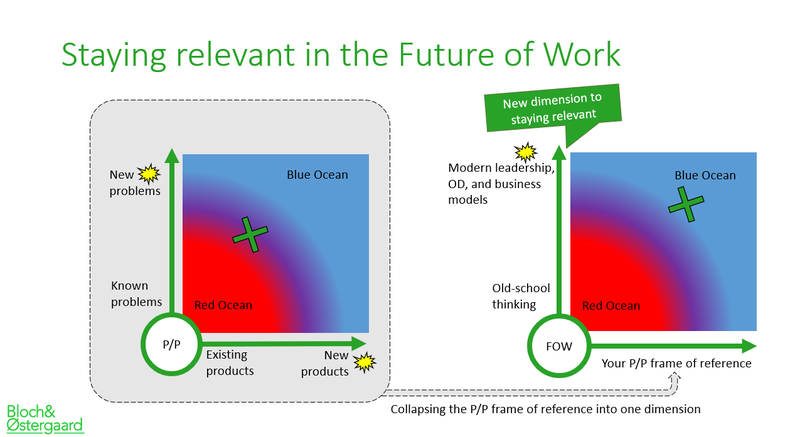 Staying relevant in the future of work is a dynamic stability, that requires way more touch-points than classical business operation. Proper change management is an absolute requirement, just as ambition and courage is. The key is to CREATE your future. Go re-frame and CREATE your Blue Ocean.